What a great post, I am having some slow issue with my wifi even when I am next to my router with the laptop. Does a microwave interfears with signal when not in use? This series of postings is so helpful, and now I need to ask a really basic and stupid question. If I want to change the encryption on my ActiontecM1424 Rev F router to WPA2, how do I determine what IP address to go to, etc., so I can do this? Unless you have changed it (and if you're asking this question, you almost certainly have not), you want to go to 192.168.1.1. (This is the default address for most routers). Here's an interesting article that I thought I would tack on. Has some great tips. 1. Use same SSID for all radios on the same network (be they 2.4GHz or 5GHz). If you have one network in your home but have either multiple routers/access points for better coverage or multiple radios in one access point, the advice is the same: use the same SSID (wireless network name) for all of them and let the client devices each decide which is best to use. Apple devices choose networks by your preferred order. Period. If you have multiple networks of different names your Mac or iPhone will always choose the first in your iCloud-synced "Preferred Networks" list even if this one isn't going to give you the best bandwidth. If you have the network name/SSID the same then it will chose the radio that it predicts will give the best throughput (which isn't always the one with the best signal, but that's an even geekier discussion you can hear in the show). Make all the Wi-Fi networks in your home the same. Your life will be better for it. 2. Deal with congestion with more access points using less power. In response to a listener's query about how best to deal with having lots of access points in a small location, say an apartment building, the best thing to do is to actually increase the number of access points but lower the transmit power on each so as to keep them from interfering with each other. It's good if your neighbors do this, too, of course, but it will help even if it's just you. We recommend using Powerline adapters to connect all of your access points together to avoid the headaches of just extending Wi-Fi. 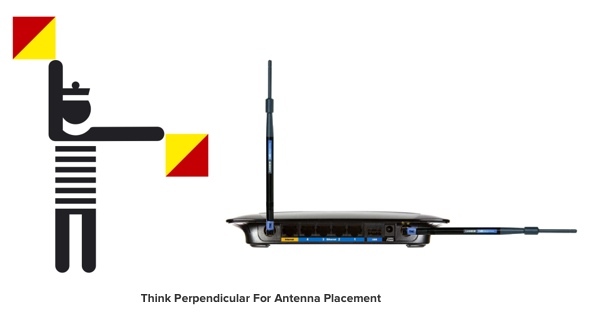 Next: When to use Wide channels and Antenna Orientation. 3. Don't use "Wide" 40MHz channels on 2.4GHz. 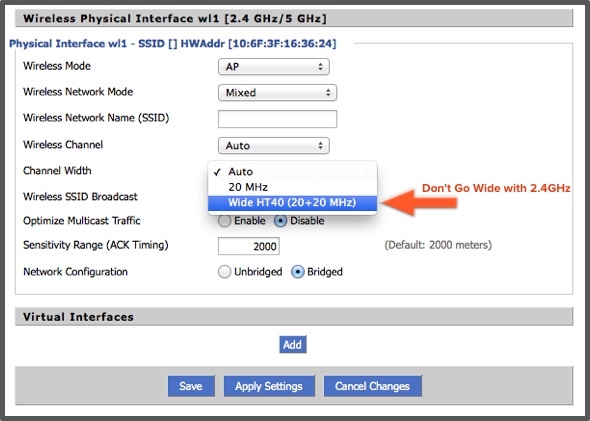 Some routers (not Apple's) will allow you to use "Wide" channels on the 2.4GHz band. The problem is this band is so congested that you'll likely just wind up making things worse instead of better. Bluetooth lives here, too, and will appreciate the breathing room. Plus, Apple made the decision years ago to not support these wide channels at 2.4GHz, so even if your router allows you to enable it your iPhone and MacBook won't use it. On your 5GHz radios 40MHz channels are perfectly acceptable (again, your Apple router takes care of this for you). And with 802.11ac (5GHz only) you may wind up using 80MHz or even 160MHz channels. Just remember that current 5GHz implementations only have enough room for TWO (yes, 2) 160MHz channels, so choose wisely. The good news is that current 802.11ac routers use "cognitive radio" technology. This means they listen before they talk and that will ratchet down from 80MHz (or 160MHz) to something lower if they see another router communicating in the same band. Smart. Some side notes: If you own an ActionTec MI424WR Rev. F, G, or I from Verizon, absolutely set the router to only use WPA2 AES mode only. Otherwise you're throwing away some good capabilities you were given. 1) If you run an open network (with no wireless password) in Compatibility Mode (802.11b/g/n), you will only get 802.11g connection and speeds regardless of your computer's capability or proximity to the router. 2) As soon as you turn on WPA2 encryption, still in Compatibility Mode, the exact same computer will suddenly realize that 802.11n is available and will connect much faster. 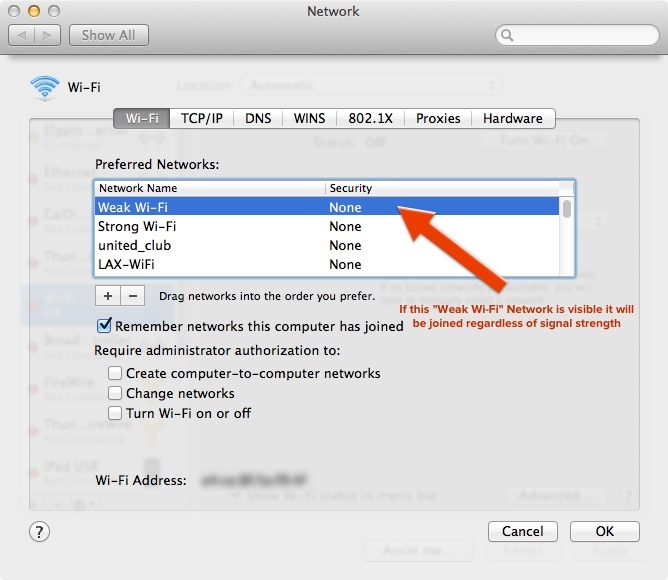 3) If you go to Performance Mode (802.11n only), there is no way to turn off wireless authentication (i..e, not require a password to connect to the wifi). It appears that ActionTec, either of their own choosing, due to a bug, or because Verizon requested it, has mandated that 802.11n is not possible without a wireless password. Not sure why anyone would want to run WiFI without a password. I use several dozen WiFI devices at home(along with several dozen wired) There has never been any issue for me entering a password for a device. I just need to enter it once. I've been using multiple APs with identical SSIDs for many years. It has always worked great with my wireless devices. Currently I'm using four APs with three using 2.4Ghz and all four using 5Ghz. The poster said "Because that's how I prefer to run my home network (no, I'd rather not get into the wisdom or lack thereof... I have good reasons)"
Use your imagination! Maybe he lives on a 500 acre farm that is heavily secured where you will encounter security before you get in wfi range.